Believe it or not, I have been designing lately. In fact — and this is just between you and me, you understand — I published a couple of patterns just today. Not only that, but I’ve put them on sale for a couple of days to celebrate their release (details at the bottom). Look! Nusha salutes my efforts. The set is called Firenze, because its inspiration comes from a particular Italian Renaissance painting (more on that tomorrow). First, let me show you the mittens. 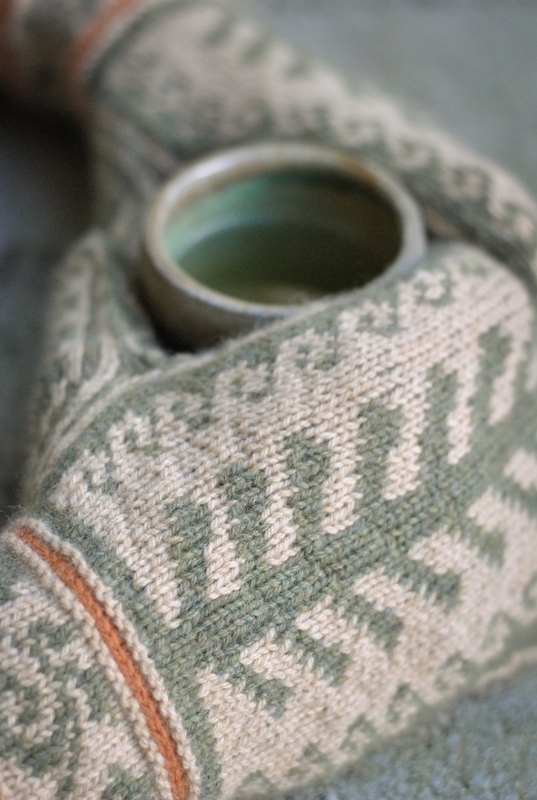 The Firenze Mittens are stranded colourwork mittens with a Scandinavian thumb. This thumb style comes out of the palm of the mitten, with a gusset to accommodate the ball of your thumb. See? This style also allows for narrower cuffs, which can fit inside your coat sleeve. There’s a nod to Renaissance-style embellishment in the form of contrasting Vikkel braids at the top and bottom of the cuffs. If you haven’t done these before, don’t worry: there are instructions in the pattern, and the one-colour braid is much (much, much) easier than the more common two-colour braid, in my experience. I’ve done separate, slightly different charts for the small (7″/18cm circumference) and the large (8″/20cm circumference), because the fabric is so right in this yarn at this gauge. Also, as someone with large hands, I’ve come to the conclusion that adjusting the chart at my end makes for much nicer mittens than adjusting the gauge at your end. 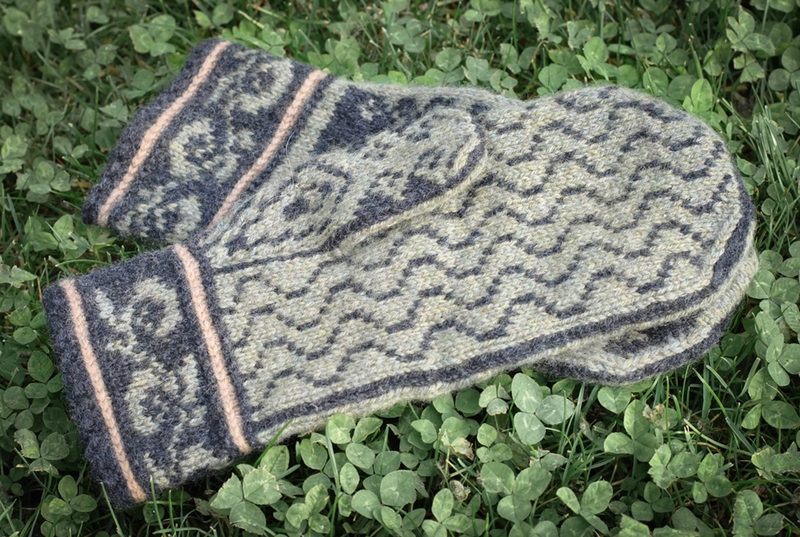 This approach won’t work with every design, but it’s how I’ll be doing most mittens in the future. So that’s the mittens. May I now show you the cowl? 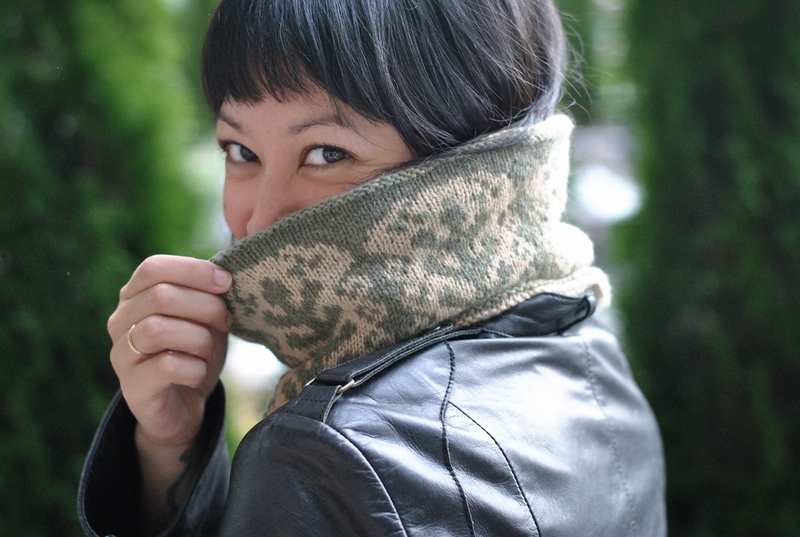 The Firenze Cowl is reversible, with a different stranded colourwork design on each side. 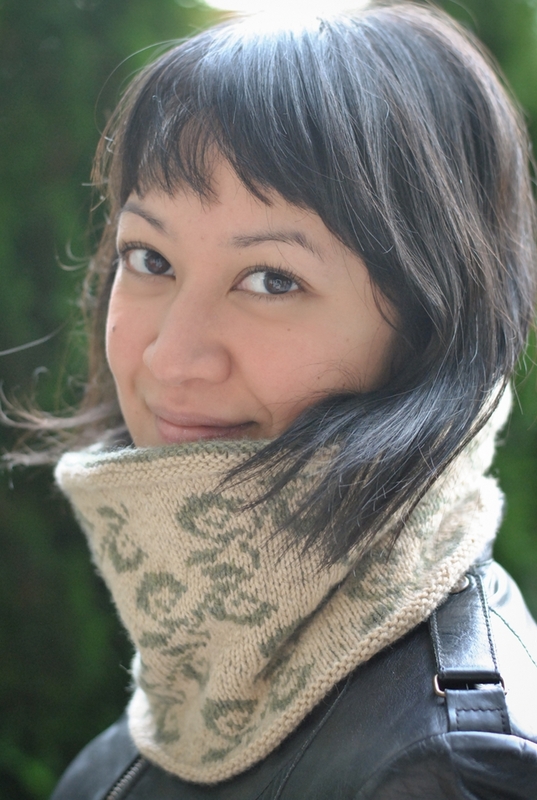 To make this cowl, you knit a long tube, and then fold it in half and graft the cast on to the bind off using Kitchener stitch, making a very squishy, double-layered fabric. Both of these designs are worked in Sunday Knits 3-ply, which is a soft, light sport weight that comes in four different fibre compositions and a impressive array of colours. The cream colour is Nirvana (92% select fine merino, 8% cashmere) in Sand; the green is Eden (100% extra-fine merino) in Sage; the grey is Nirvana again, in Charcoal; the orangey braid on the Sand & Sage mitten and the goldish braid on the Charcoal & Sage mitten are in Eden, in Curry and Fawn, respectively. Sunday Knits 3-ply also comes in Angelic (75% extra fine merino, 25% angora) and Brigadoon (100% extra fine merino tweed). It’s available in 50g (246 yd/225 m) and 20g (98.4 yd/90 m) skeins; you can make the whole Firenze set with one skein of each size in each colour. Many, many thanks to Carol Sunday for her generous yarn support and encouragement. Thanks also to Heike Madeleine for her patience and skill in test knitting these. Those luscious photos? Those, my friends, are by my rather wonderful sister, Nusha Elliott, of Nusha Elliott Photography. 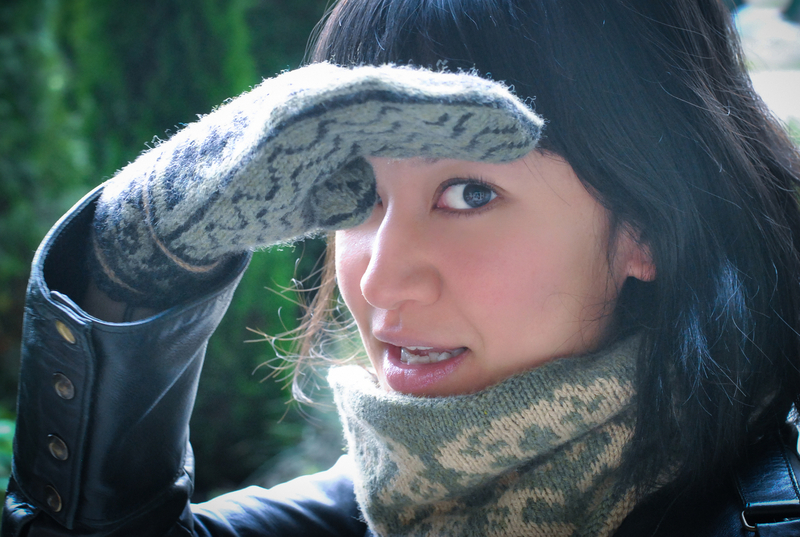 She’s also the model in the cowl photos, which is why they look so damned good. So. The sale. These patterns have been a while in the making, so to celebrate their release, I’m offering 25% off the individual patterns (Firenze Mittens, Firenze Cowl) and 15% off the set until midnight Friday, Central Time (North America). You don’t need a coupon code — the discount will come off automatically. Tune in tomorrow for the gripping conclusion: Why Firenze? Where did the idea come from? Post script: Nusha tells me that the photos of her were taken by my brother, Thomas, as she doesn’t have super long octopus arms. Nusha did the editing, though.